The "yaya meal" at Balesin Island Club in Polilio, Quezon is just an option, an executive from the high-end resort said in a statement. 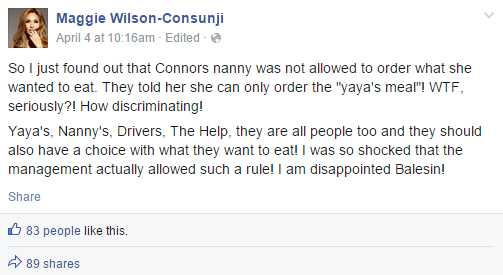 "We at Balesin Island Club do not understand this entire hullabaloo about the “yaya meal.” Any talk of discrimination is inappropriate. In fact, if the guest or member chooses to have the Club serve the “yaya” tenderloin steak and lobster thermidor, we will gladly serve it to the yaya," said Mike Asperin, Balesin Island Club chief executive officer and island director, in a message posted on the resort's Facebook page. "Yaya meal," he added, "is merely an accommodation and an option for the guest for their “yaya”. Hence, we do not serve this meal if there is no instruction at all from the guest for a “yaya meal” to be served to a “yaya”. Incidentally, the yayas are thrilled with their meals because these are deliciously prepared by our chefs, as well, for our operating staff at Balesin." The controvery started when former Miss World-Philippines Maggie Wilson-Consunji turned to Facebook to say that she was disgruntled with Balesin where she and her family stayed for most of the Holy Week. On Black Saturday, April 4, the fashion designer claimed that the resort denied her mother to order the same food that her son's nanny ordered for the reason that it is a "yaya's meal." 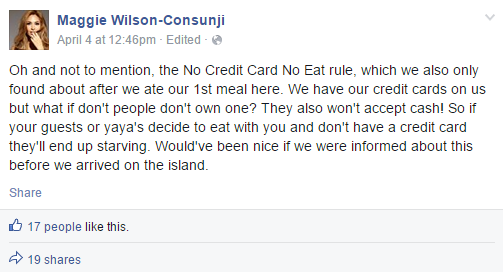 In a separate post, she also exposed Balesin's "No Credit Card No Eat rule." Consunji went on to narrate what happened. 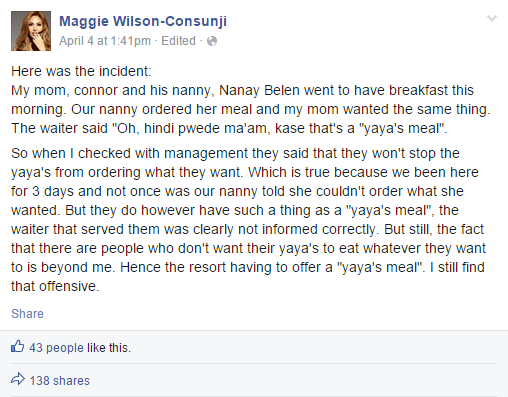 The "yaya meal" controversy immediately sparked outrage from Filipino netizens when it circulated on news blogs and mainstream media websites. 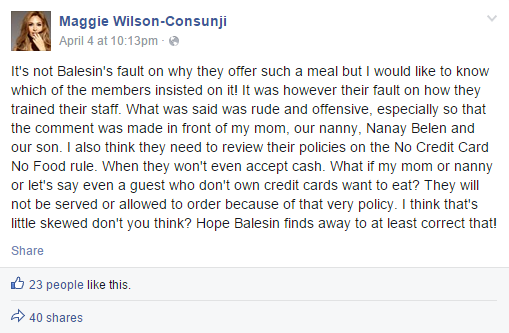 Enraged social media users described the item in Balesin's menu as "discriminatory" and "insensitive." Some called for a probe on the incident and even the closure of the resort. Later that day, the former beauty-queen had a clarificatory post which puts the blame on how the posh club trained their staff. 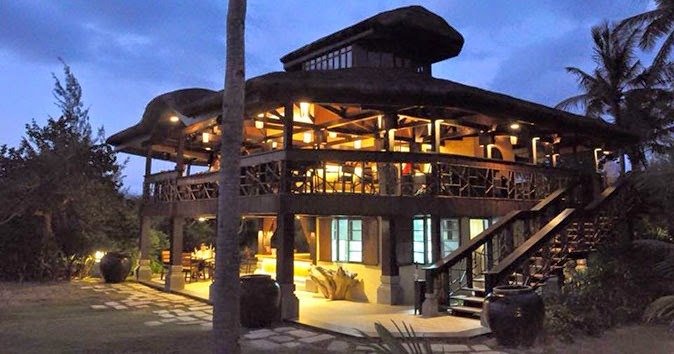 A report aired Monday, April 6, on ABS-CBN's primetime newscast, TV Patrol, said the Department of Labor and Employment (DOLE) would conduct an investigation to determine if there are establishments like Balesin that have policies which are insulting or discriminating to household helps. Gerry Rubio, head of DOLE's communications and media office, said the "patterned show of disrespect" in connection with the "yaya meal" scandal falls under "discrimination in occupation."